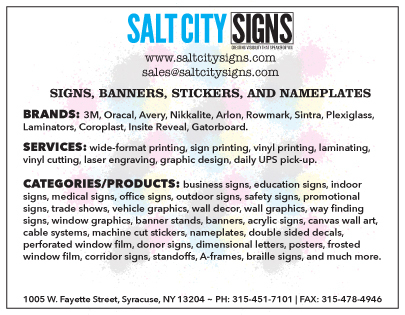 Salt City Signs is one-stop-shopping for all your signage needs. We are committed to listening to our customers to provide them with the best possible visual communications solutions. We understand that signage is an investment in your business or organization and can help you find the solution to best present your message to the world today and into the future. Our friendly and knowledgeable staff is dedicated to customer service and is prepared to work within your timeline regardless of the size of the project. Whether you need a single banner or 1000 backlit displays, attention to detail is important to us regardless of the size of your order. Call or email us today for a free estimate. Since 2001 Salt City Signs has served a wide variety of businesses and industries with a wide variety of products and services. These include but are not limited to; stickers, banners, decals, vehicle lettering, window lettering, yard signs, real estate signs, hard hat decals, labels, wall grahics, acrylic letters, construction signs, POP displays. packaging, wayfinding signs, office signs, business signs, and acrylic signs. Our central location in downtown Syracuse and close proximity to Destiny USA and Armory Square make us a logical choice for site surveys, graphics creation and output, and graphics installation for many local businesses as well as large companies with a presence around Central New York. Call or email us today to discuss how we can help your business.